One key to an Anthony Davis trade is whether the Pelicans can acquire a player with All-NBA potential as part of the package. That’s among the priorities for New Orleans’ front office, which is also seeking young talent, draft picks and salary-cap relief for Davis, Adrian Wojnarowski of ESPN tweets. If the Pelicans view Brandon Ingram, Kyle Kuzma or Lonzo Ball as that type of player — all of whom are rumored to be in the latest offer from the Lakers — that would increase the possibility of Davis going to Los Angeles. If New Orleans sees that potential in the Celtics’ Jayson Tatum, the team may wait until the offseason, when Boston has the freedom to trade for Davis. The Pelicans are hoping to dump Solomon Hill‘s contract in any trade involving Davis and if the Lakers were to acquire him, they would use the stretch provision on his contract, Brad Turner of the Los Angeles Times tweets. Hill is making $12.52MM this season with another guaranteed $12.76MM next season. That three-year stretch would count as $4,257,927 annually and the Lakers would also have an empty roster charge of $897,158 added during the offseason if they waived him, Eric Pincus of Basketball Insiders tweets. In the aftermath of the blockbuster deal with the Knicks for Kristaps Porzingis, Mavericks owner Mark Cuban says the team is laying low prior to Thursday’s trade deadline, Brad Townsend of the Dallas Morning News tweets. “We’re not actively pursuing anything,” Cuban said. The Wizards have significant interest in Jazz forward Derrick Favors, according to Tony Jones of The Athletic. Favors has been rumored to be part of the package Utah would send to the Grizzlies for Mike Conley. The Jazz are also interested in Otto Porter Jr. and Washington would want Favors in any deal involving its small forward, Jones adds. However, the Wizards are considered unlikely to move Porter this week. The Jazz and Grizzlies have explored a trade involving Mike Conley and Ricky Rubio, and Zach Lowe of ESPN.com hears that Utah’s interest in the former No. 4 overall pick is “very real.” The organization could feasibly build a package around Rubio and Derrick Favors, who are both on expiring deals, while peppering in a draft pick or two. Utah is reportedly unimpressed with the 2019 draft class and their first-round pick is on the table in trade talks. It’s unclear if the Jazz would toss in a second first-round pick for Conley, though it would be a surprising development. Lowe speculates that Dante Exum could be in the mix as part of a package, adding that the Jazz could move on to more affordable targets, such as Nikola Mirotic, if the price for Conley remains too high. Marc Gasol is hoping for a trade and teams are waiting to see if the Grizzlies lower the asking price for their long-time center, Lowe reports. As for a potential Pistons-Grizzlies deal, Memphis has not shown any interest in acquiring Andre Drummond yet and Lowe hears that Detroit may be saving its trade chips for someone else. The Pistons and Grizzlies have talked about a Conley deal, though discussions did not get very far. Detroit would likely have to ship out Reggie Jackson is a trade for Conley. While Conley would be a nice on-court fit for the Pacers, Indiana has stepped away from Conley talks, sources tell Lowe. Lowe speculates that the Grizzlies would likely ask for Domantas Sabonis is a Conley deal, something that wouldn’t appeal to the Pacers. The Jazz would have interest in signing Tobias Harris this summer should they not trade for Conley or make a major move at the deadline that utilizes their future cap space. The Clippers have received calls for Harris, per Lowe, though rival teams get the sense that they have no interest in trading him. Lowe adds that Los Angeles would be happy to re-sign Harris in the offseason. The Kings are not as interested in Gasol as reports and speculation might suggest. Sacramento doesn’t appear to be willing to hand over a future first-rounder in exchange for the big man, as the club owes its 2019 pick to Boston (Philadelphia gets the selection if it’s the No. 1 pick). Behind the Anthony Davis drama, the Pelicans are ready to start taking their current roster apart in exchange for future assets, according to Sean Deveney of Sporting News. He adds that their most enticing trade piece is stretch forward Nikola Mirotic, who is drawing interest from both the Sixers and Jazz. New Orleans is seeking a first-round pick in exchange for Mirotic, who has been sidelined for the past week with what Deveney calls “a so-called calf strain.” A league source tells him that the Sixers, who have needed forward help since sending Dario Saric and Robert Covington to Minnesota in the Jimmy Butler trade, have contacted the Pelicans about Mirotic. Philadelphia owns all of its future first-rounders, along with Miami’s in 2021, and a wealth of second-rounders, including the Bulls’ this year, the Knicks’ and Nets next season and four in 2021. The Jazz, who were considered frontrunners to wind up with Mirotic when the Bulls were looking to move him last season, are also in the mix, Deveney adds. It’s uncertain whether Utah is willing to part with starting forward Derrick Favors or would offer young players such as Raul Neto and Tony Bradley in addition to a first-round pick. Deveney notes that other teams could still enter the race for Mirotic, such as the Trail Blazers, who are seeking to add roster depth, and the Rockets, who have been eyeing him for a long time. Mirotic, 27, is averaging 16.7 points and 8.3 rebounds through 32 games and is shooting 36.8% from 3-point range. He is making $12.5MM on an expiring contract. Jazz forward Derrick Favors has seen his name surface in several trade rumors over the years, but the 27-year-old remains the longest-tenured player on the active roster. The latest rumor of Utah expressing interest in Bulls forward Jabari Parker once again brought forward the idea of trading Favors, who is taking everything with a grain of salt. “I was telling one of the coaches, I could go back years and years ago and I can name each guy I was supposed to get traded for,” Favors said before the Jazz-Rockets game on Monday, according to Eric Woodyard of The Deseret News. “Every year, I can just name them so I have fun with it, I enjoy it. Favors’ awkward fit alongside Rudy Gobert could once again force the team to explore trading him, with the Georgia Tech product averaging 11.1 points and seven rebounds per game this season. He’s started in 26 of 31 games so far and signed a two-year, $40MM deal to stay with the club this past free agency. Brett Dawson of The Athletic breaks down the Thunder‘s decision to pick up coach Billy Donovan‘s option for next season, detailing why the front office is happy with the direction Donovan is guiding the team. Oklahoma City holds the league’s fourth-best record at 20-10, including a stellar 12-3 home record, and has played with great enthusiasm and effort so far this season. Rajon Rondo (hand) and Brandon Ingram (ankle) participated in full practice Thursday as they continue to work toward returning, according to Ohm Youngmisuk of ESPN.com. 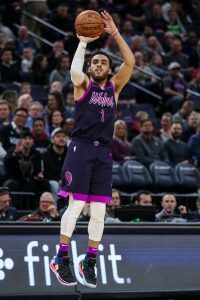 The two players were assigned to the South Bay Lakers, G League team of the Lakers, this past week to help expedite their recoveries and allow them to practice further. The Jazz are one of the teams that have interest in Bulls forward Jabari Parker, according to Kevin O’Connor of The Ringer. A report on Friday indicated that Chicago had engaged in trade discussions involving Parker, who doesn’t project to be part of the Bulls’ future and has drawn interest from multiple clubs. Parker’s appeal as a trade chip may be somewhat limited, given his subpar defensive play and his $20MM salary. If the Bulls were willing to take on a multiyear contract or two in exchange for Parker’s expiring deal, it could open up additional opportunities, but finding the expiring salaries necessary to match that $20MM figure will be trickier. Still, as O’Connor observes, the Jazz are one team that could be a match, as Derrick Favors is earning $16.9MM and has a non-guaranteed salary (also worth $16.9MM) for 2019/20. Favors isn’t an ideal frontcourt fit next to Rudy Gobert and may not have a future in Utah, so the Jazz may be in the market for a stretch four like Parker who could better complement Gobert. Of course, from the Bulls’ perspective, Favors – who can’t be moved until January 15 – wouldn’t be a particularly attractive return on his own, considering the Bulls already have Wendell Carter, Lauri Markkanen, Robin Lopez, and Bobby Portis in their frontcourt. O’Connor notes that it’s hard to see Chicago taking back Favors in a Parker deal unless additional assets are included. While it remains to be seen if the Jazz are the right fit for a Parker trade, it seems inevitable that Chicago will make a deal at some point before February 7. A source told Joe Cowley of The Chicago Sun-Times over the weekend that Parker’s camp is hoping the Bulls will move the former No. 2 overall pick and is working with the team to try to find him a better situation. With Mohamed Bamba‘s NBA career off to a promising start and Nikola Vucevic on an expiring contract, the prevailing wisdom suggests that Vucevic’s days with the Magic may be numbered, writes Sean Deveney of The Sporting News. However, multiple league sources tell Deveney that Orlando isn’t looking to move the veteran center at this point. While the Magic have explored the trade market for Vucevic in past years, they’ve yet to entertain offers this season and have been happy with how he has looked so far, per Deveney. The club also doesn’t want to put too much pressure on Bamba before he’s ready. Of course, if Orlando falls out of playoff contention by February and is offered a first-round pick for Vucevic, the team’s stance could change. For now though, he’s not being shopped. Although Derrick Favors signed a new two-year deal with the Jazz during the summer, his $16.9MM salary for 2019/20 is non-guaranteed, and few people around the NBA expect him to still be in Utah at that point, according to Deveney. Favors could be a trade candidate at this season’s deadline if the Jazz are able to move him a more versatile forward. The Cavaliers are unlikely to go into fire-sale mode anytime soon, one executive tells Deveney. “Don’t hold your breath,” the exec said. “If they decide to blow it all up, I don’t expect that to decision to be made until we get close to the deadline. They still think they can win.” If the Cavs do start moving veteran pieces, Tristan Thompson is one player to watch, says Deveney. Jonas Valanciunas is no longer an every-night starter for the Raptors, but he’s been very productive in a reduced role for the team and there are no plans to move him, sources tell Deveney. Robin Lopez (Bulls) and Dewayne Dedmon (Hawks) are unlikely to net first-round picks on the trade market, but they could be decent rental options for teams seeking depth up front, Deveney writes. Nuggets center Nikola Jokic didn’t technically sign a maximum-salary contract when he re-upped with the club this summer, but he can increase his 2018/19 earnings to the maximum if he helps lead Denver to postseason success. As ESPN’s Bobby Marks details (subscription required), Jokic is one of several NBA players with incentives in their contracts for the coming season. In Jokic’s case, he’s currently about $862K shy of his maximum salary, but he can earn $431K if the Nuggets advance to the playoffs, and another $431K if they win in the first round. Aaron Gordon has a potential path to an All-Star nod in an Eastern Conference that lost more top talent this offseason. Gordon’s new contract with the Magic calls for a $500K bonus if he’s named an All-Star, per Marks. He could also further increase his earnings by being named to the All-NBA and All-Defense teams at season’s end. Jusuf Nurkic can earn an extra $1.25MM this season if he appears in 70 games and the Trail Blazers crack the 50-win threshold, according to Marks. Nurkic played in 79 games last season, but because Portland only had 49 wins, this incentive is considered unlikely and doesn’t currently count against Nurkic’s cap hit. Davis Bertans has to meet several criteria in order to earn a $250K bonus on his new contract with the Spurs — the veteran forward must play in 70 games, make 165 three-pointers, and average 6.5 defensive rebounds per 36 minutes, as Marks details. Dante Exum, Raul Neto, and Derrick Favors all have incentives on their new deals with the Jazz, with a focus on games played — they all must appear in at least 67 games to start earning their bonuses. Favors, in particular, has plenty riding on his performance, as he can earn $2.8MM in incentives. Of those incentives, $900K are considered likely and already count against his cap charge. Marks also notes that several players will have a chance to become eligible for super-max contracts with their current clubs if they make All-NBA teams this season. That list includes Anthony Davis (Pelicans), Draymond Green (Warriors), Klay Thompson (Warriors), Damian Lillard (Trail Blazers), and Kemba Walker (Hornets). Additionally, Devin Booker‘s new extension with the Suns would start at 27.5% of the cap if he’s named to the All-NBA Third Team, 28.5% if he’s named to the Second Team, and 30% for First Team.